When a first love is a forbidden love . . . There were so many reasons that should have kept us apart, least of all, the decade that separated us. Growing up in New York City, I learned early on that love is a double-edged sword. Love broke up my parents, love took away my friends, and love—the big, intense, never-been-like-this-before love—landed me in therapy. Now I'm heading to college, and it's time to give love a clean slate again. But, can I really start over when he's still in my life? Because the one man I've always wanted, and also the only guy I absolutely can't have… And he wants me just as fiercely. 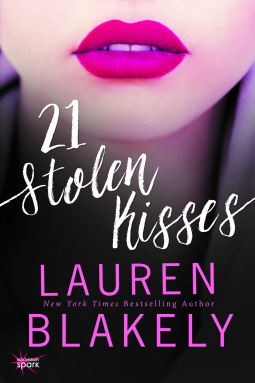 21 Stolen Kisses is a refreshing read. I thoroughly enjoyed it. In this book I was introduced to Kennedy who is the daughter of a high profile actress and Noah is her agent. Kennedy 's parents are divorced and she carries the guilt of keeping the secrets of her mother's numerous affairs. Kennedy wants to be nothing like her mother. She hates the secrets she was forced keep and how they have affected her relationships with friends. Kennedy struggles with finding herself. There are only a few people that Kennedy feels like she can be herself around. Noah being one of them. Noah doesn't know all of Kennedy's secrets. Noah himself becomes her biggest secret of all. Noah is older than Kennedy. Kennedy is not the age of majority yet, however in New York 17 is the legal age of consent. But Noah knows that he is treading lightly on forbidden ground. As much as his head is telling him to stay away from Kennedy, his heart is telling him the opposite. He and Kennedy have a connection. One that they are both happily to oblige. Kennedy doesn't make it easy for Noah, but does he really want her to. I have a copy of the letter still, a chronicle of my so-called "21 Stolen Kisses." I keep it in a safe-deposit box so no one can ever see it. That's the only thing in the box, because it's the only thing I have that's priceless to me. Time doesn't seem to be on Noah and Kennedy's side. Should Noah wait until Kennedy is eighteen to pursue something between the two of them? Will a few stolen kisses between the two change everything? Is Noah willing to risk everything he has worked so hard for, to pursue a relationship with his client's daughter? Everything fits, especially me with him, and him with me. He is the puzzle piece that slides into place in my heart, filling all the sad and empty spots inside me. While reading 21 Stolen Kisses, I never felt that the story didn't flow. I never thought that Noah shouldn't pursue Kennedy. Some may think the age distance should have been enough, but that is not true with this story. Time was not on their side. The timing wasn't right. Maybe if they had met a few years later, their relationship would have been totally different. Maybe if they were the same age, things would be different. There could be a million "maybes" or "ifs", but the one thing that stayed constant, was Noah's affection and love for Kennedy. "Can I give you a stolen kiss, K? ""You don't have to steal it, because I'll give it to you freely." If Kennedy needed time, then Noah would give it to her. Noah experienced college, Noah was able to make his own decisions, so if he needed to allow Kennedy to do the same, and hope that in the end, she would make her way back to him, than that was what he would do. 21 Stolen Kisses was on my kindle for awhile. I wished I would have read it sooner. This was a refreshing, heartwarming read. It is quite different from the other books I have read by Lauren Blakely. This is a book about second, maybe even third chances.